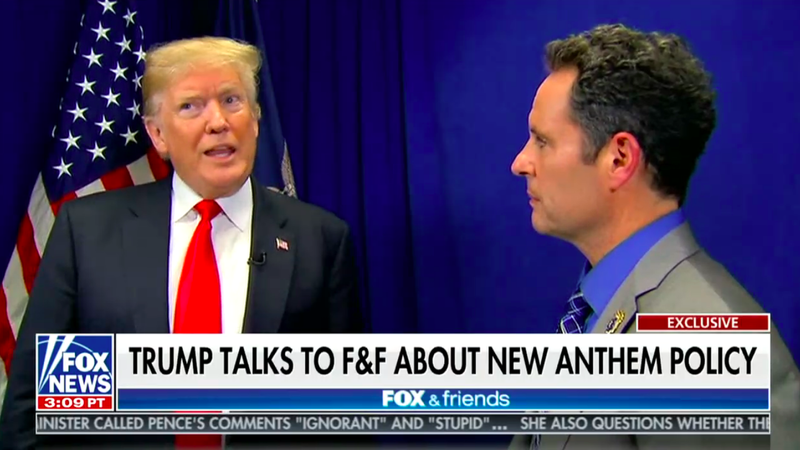 Trump talks NFL, North Korean denuclearization on "Fox & Friends"
And now for something completely different: Trump also said that he approved of the NFL's decision to require players on the field to stand for the national anthem, adding that those who don't "maybe...shouldn’t be in the country." His full NFL quote: "I think that’s good, I don’t think people should be staying in locker rooms … You have to stand proudly for the national anthem or you shouldn’t be playing, you shouldn’t be there — maybe you shouldn’t be in the country … The NFL owners did the right thing if that’s what they’ve done." On an immigration deal: "I think it’s time to get the whole package, it’s not such a big deal, Brian. It’s time to get the whole package." On James Comey: "I think a thing that I’ve done for the country — the firing of James Comey — is going to go down as a very good thing."